Sydney - One unanticipated but pretty obvious effect of greenhouse gases and heat is to grow a lot of plants. Extra CO2, for example, promotes flowering. The main areas where this is happening turn out to be India and China. The Greenhouse Effect is global warming’s older cousin, almost forgotten in the haze of “debate” about global warming. It’s basically a thermal and environmental shift caused by higher temperatures. The world’s two biggest centres of population and pollution are the beneficiaries of a mix of growing conditions and many local programs for greening specific areas. Both countries have policies in place to manage and promote green spaces, both natural and agricultural. According to NASA, human activity is responsible for visible greening in two of the world’s most contentious environmental spaces. Both India and China are routinely accused of being causes of major environmental problems. It must be said, however, in all fairness, that they do put in enormous effort to manage their environments and correct serious failings caused by old industrial and other issues. The NASA image of China and India together is a solid mass of green, and in some rather unexpected areas, too. 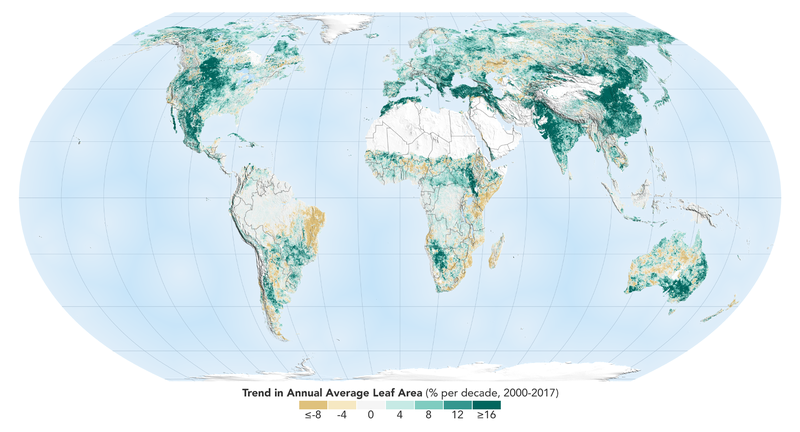 The NASA image shows increases in “leaf area” on a percentile base, from 2000 to 2017. Some of these areas are truly gigantic, about the size of France or Germany. Note: For the purposes of analysis, agriculture is a bit of an each way bet in greening terms. Crops do add a lot of greenery, but come with some caveats in terms of economic, land use issues and environmental values. A NASA global map is also a good metric for comparison worldwide. Strangely green spaces include Turkey, parts of Australia, central North America in both the United States and Canada, Mexico, and odd places like Morocco. Even semi-deserts are greening, although off a very low base. The Greenhouse Effect, caused by emissions, can be interpreted as an offset in terms of creating more green carbon scrubbing capacity. That’s not quite the whole story, however. Plants absorb CO2 at different rates. Greening vs emissions doesn’t add up to a solution. While the increased greenery certainly helps, it doesn’t make global warming any less dangerous. With the emissions come severe temperature effects, wild weather of all kinds, (I’m writing as a dust storm sails over Sydney) and of course all those climate based disasters we’re all so fond of these days. A reduction in emissions, combined with added greening, will have an exponential benefit, but there’s some pretty solid number crunching to do on that subject. The added greening will also help soil quality, carbon sequestration, and the water, carbon, nitrogen and oxygen cycles to re-normalize or improve. It’s a bit too early to tell how this mechanism will work. The trick is to figure out how temperatures impact this process. Local climate variations, demand for water for agriculture and natural environments, and similar issues, add even more complexity. The good news is that greening is part of the overall solution to global warming. Let’s not screw it up, eh?